On last March 3rd I took some photos of C/2011 L4 (Panstars). Here I present an excercise of astrometry using one of those images to extract some meaningful data from this observation. What I do here can be applied to any other comet image or, in fact, celestial object in the sky. My aim is to show a simple example of practical applicaton of mathematics and geometry in the determination of sizes of celestial objects. A digital estimate of the comet brightness will not be attempted however, because this would involve a complex process of image calibration. I should also mention the need of a good sky simulator software (for all practical purposes I will use Stellarium, but other software could work as well). These are the 'inputs' of the work and the 'outputs' are described above, the physical dimension of the comet (at least an approximate value for this dimension). Below I coment step-by-step all procedures that I used to find the final estimates. This exercise demonstrates a practical aspect of astronomical observation, something that is fully in agreement with the objectives of this blog. I use the image publish on last March 4 2013 reproduced below. The image was acquired on March 3rd at 22:15 UT and it is an important input for the determination of additional parameters as we will see. Fig.2 shows not only Panstarrs but also a star named HIP 117488 of mag. 7.0. 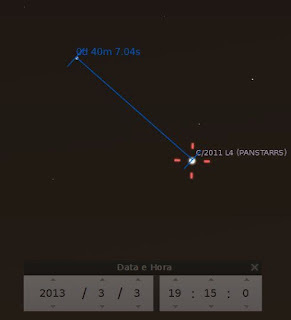 This star was easily identified with Stellarium using the date and time as input for the skymap display. The apparente distance between the star image centroid and the 'comet nucleus' is about 40' (forty minutes of arc) - Fig. 3. Fig. 3 Estimate of apparent distance between HIP 117488 and comet C/2011 L4 at the date as given by Stellarium. Sf = 40'/355.1 ~ 0.113'/pixel. This is nearly 6" per pixel and corresponds to the final resolution of the image. Note that this value is the overall resolution of both the combined optics and camera setup. Therefore, each pixel in the image at the comet position corresponds to about 5400 km. 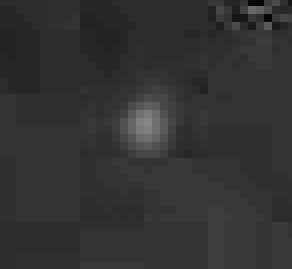 The smallest pixel in the image, in particular the one corresponding to the "comet nucleus", is a square of ~5400 x 5400 km, much larger than the expected physical size of that nucleus. The image is in fact a matrix of intensities on an arbitrary scale (in a grey scale 8 bit image, the intensity goes from 0 to 255). If we extract a small portion of the original image (after converting it to grey scale), say, a square of 35X35 centered at HIP 117488, we get Fig. 4. Fig. 4 A small sample of the original image showing HIP 117488. Fig. 5 Intensity surface of Fig. 3 of HIP 117488. Fig. 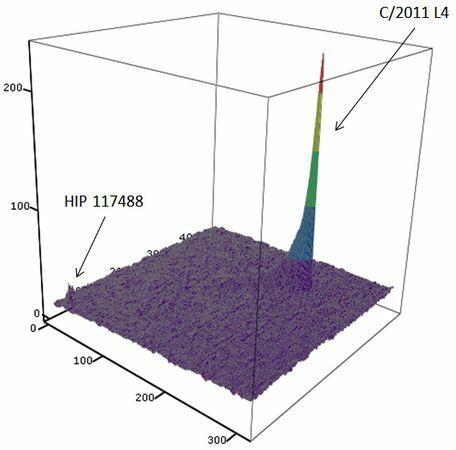 6 3D intensity plot of the original image showing the comet and HIP 117488. The apparent tail length was small (nearly 1/3 of the moon diameter). Fig. 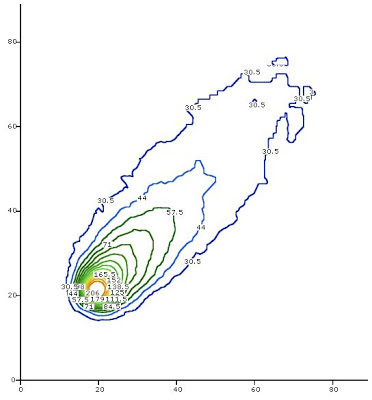 7 Intensity plot of the coma. Fig. 7 is a zoomed version of Fig. 1. 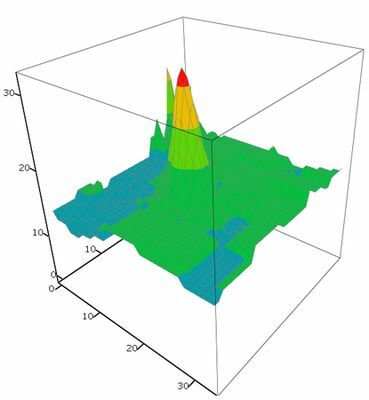 If we take the dimension of the coma region as nearly equal to que inner square (between 16 and 24 on the X-axis and 16 and 24 on the Y-axis), a good estimate of the coma condensation will span an area of 8 pixels X 8 pixels or almost 1'x 1'. 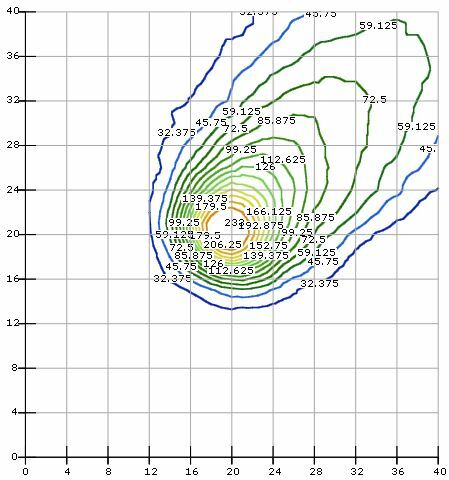 This corresponds to sphere of ~50000km of diameter. However, if the outer intensity curves are regarded, the coma will have twice that size. 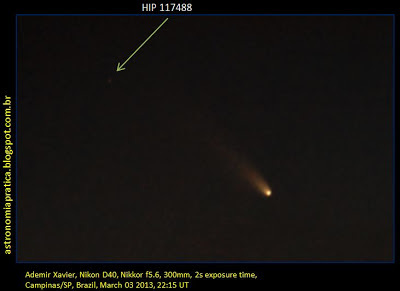 Thus the coma of Panstarrs was estimated to have an apparent size of 2'x2' or 90 000km of extension on last March 3rd. It could be argued (with reason) that the estimated tail size must be corrected for the geometrical situation shown in Fig.8. 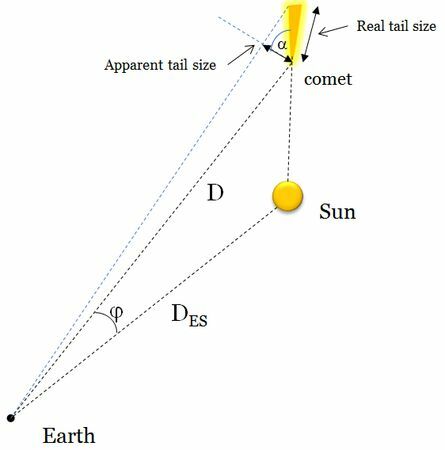 The comet tail always points towards the sun (along the Sun-comet line), while we are observing the projection of this line on the perpendicular to the Earth-comet line. Real Tail(km) = Apparent Tail(km)/cos(alpha). so that cos (alpha) = 0.8944249989. Real Tail(km) = 90.5 x Sf(km)/cos(alpha) = 545 000 km (~340 000 mi). Compare this with the Earth-Moon distance (384 400km). 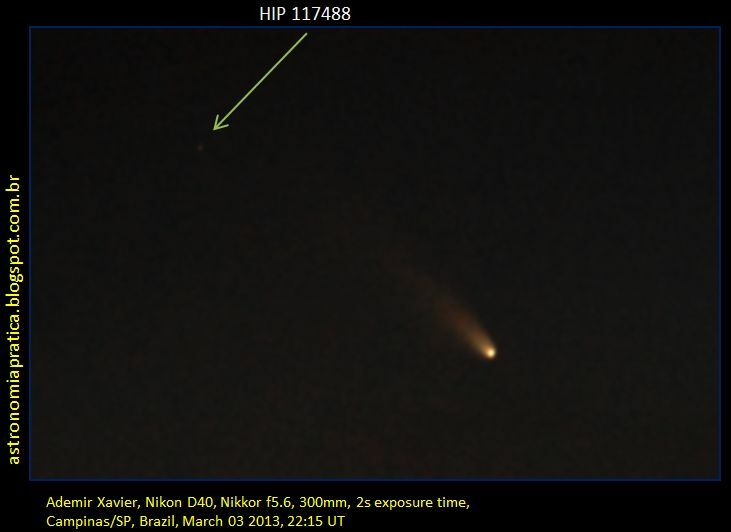 There is no accurate definition of a comet tail (that depends on the density of particles such as dust, gas etc). What we can say here, however, is that, given the "definition" of tail as determined by the smallest intensity level on Fig. 1 (30.5), the real tail extended itself for half a million kilometers in space on the date.